I recently ceased writing articles for magazines, but some serious arm twisting by Mark Denne ensured this article was attempted and completed. The following article includes chapter 7 from my book ‘In the Beginning.’ plus some other juicy bits thrown in for good measure. The railway at Westport was designed to connect the river port of Westport with the huge coal reserves to the north east. Three locomotives were ordered for the Westport & Mount Rochfort Railway project on the 10th January 1874. The first contract for the construction of this railway was let on the 18th. August 1874. John McLean, the successful tenderer for the Westport Contract, was required to construct the 7½ miles of formation and permanent way from Westport to Fairdown. The locomotives were part of an order of five and were built by Dubs & Co. of Glasgow. They were built to the design which was later to become known as class ‘C’. Shipped to Wellington by the Tiviotdale, four of the five were unloaded onto the Hannah Broomfield which left for Westport on 24th. September 1875. Imports per Hannah Broomfield from Wellington – 3 railway engines and fittings. A.D. Dodson, Resident Engineer, 1 ditto and fittings, Resident Engineer, Kaipara. The brigantine Hannah Broomfield which left Wellington on the 25th. inst., arrived off the bar at early dawn on Wednesday, and at 9.30 with a favouring breeze stood in for the river, crossing the bar without trouble. Harbourmaster Captain Leech then barded her up to the Wakefield Street wharf, where she is now moored…..The arrival of Hannah Broomfield with the three railway engines for the Mount Rochfort line, instead of two at first arranged, ought to banish the despondency….Quite a crowd of onlookers collected on the wharf during yesterday to witness the landing of the locomotives and fittings from the Hannah Broomfield. The work so far has proceeded without mishap. The locomotive for Kaipara was Dubs 800, the Hannah Broomfield left for Helensville on 7th October. Of the three landed at Westport the identity of only one can be confirmed. This was Dubs 801 which was shipped to Waitara in January 1879, becoming Taranaki Section’s C22 in 1882 and renumbered in 1890 as C167. The problem with the remaining two is that boiler records do not confirm they were in Westport and they were joined by a third Dubs C locomotive in October 1881. This locomotive was also imported by the Tiviotdale but had been sent to Napier. Dubs 804 can be confirmed as entering service on 5th. August 1876, but the boiler record does not say where, although it could be suggested this was a Westport locomotive as the railway to Waimangaroa was opened on the same date. Dubs 802 and Dubs 803 were sold to the Westport Harbour Board in 1886/87.Their earlier boiler records do not appear to have survived. So the remaining two originals could have been either of the Dubs 802/803 and 804. A Mr Fulton was instructed to erect the locomotives. Orders have been telegraphed to the Public Works Office, in Westport, to have six trucks and an engine set up and in running order by Christmas next, for use in railway work. This will probably be in preparation for laying down the permanent way on No.2 section. There will be a change also for picnic excursions, which holiday keepers will not be slow to take advantage of. Mr Fulton has charge of the work of setting up the engine and trucks , and with an active gang of hands to assist has already made good progress. In a day or two, he expects to salute Westport with the first blast of the locomotive whistle. An advertisement appears warning those who at present use the horse trucks or trollies on the railway to clear the track. The locomotive engine will be running during the present week, and as a necessary precaution all obstructions had better be cleared away. Last evening the Westport Fire Brigade mustered for a good purpose. The fire engine was taken to the Wakefield Street wharf, and utilised for watering the locomotive engine, which Mr Fulton had just put in running gear. The work was performed, and the first shriek of the locomotive whistle will greet Westport residents today. Mr Fulton will get up steam early this morning for the trial trip. Indeed a trial run was made on December 7th. A good deal of interest was excited in Wakefield Street on Tuesday afternoon at preparations for the trial trip of the railway locomotive as put in running order by Mr Fulton, of the Public Works Office. A little before 9 a.m. a start was made, Mr Fulton acting as engineer, and the engine glided along smoothly up the line, and was soon out of sight round the first curve. On the engine were Messers Dobson, Brakell, two others, and S Watson, who acted as stoker. The engine was driven to the end of No. 1 section, and afterwards brought back again without hitch or mishap of any kind. It belongs to a class called tank locomotives, the fuel and water being carried without aid of a tender. The cylinders are 9 inches in diameter, stroke of piston eighteen inches; and a tractive power a little over 8000 lbs. Under ordinary circumstances this engine will draw about 150 tons up Sergent’s Hill incline, the steepest grade of the railway, at about 15 miles an hour. On a trial run this morning every action was found perfect, and on its return all the bearings were found cool as when it first started…..The speed attained on portions of the line was 20 miles per hour, and at this rate the engine ran very steadily, thus proving the good construction of the line by the late contractor. The engine was erected in five and a half days at a cost of about 18 pounds….. There are two more to erect, and now that the hands employed by Mr Fulton know their work it would be wise to have the engines put together…..
Friday last was a great day in the Westport annals. The Mount Rochfort and Ngakawau line was opened for passenger traffic. Excursion trains were run throughout the day, there was nothing to pay, it was holiday time , and so all the trains were crowded. For years past in Westport history so many people have not been seen together. The engine gaily decorated with floral devices and bearing the motto Progress did its work bravely. The trucks bedizened too with flowers and flags bore the giant motto Prosperity to Westport, and carried instead of heaps of black diamonds, closely packed masses of merrymakers…. ….Mr Fulton is now engaged in fitting up another locomotive. A first and second class carriage, two locomotives and several trucks for the Mount Rochfort railway, are now in running trim, and steam was got up on Wednesday for the purpose of making practical tests of their working capabilities. The fitting up of the third engine for the Mount Rochfort railway is nearly completed. As of 31st March 1881 the two locomotives on the section were numbered 126 and 127. This was a South Island isolated section system that followed on from the highest number in the Hurunui – Bluff system. In September 1883 the Westport Section reported the Dubs locomotives were numbered C1, C2 and C3. Dubs 804 was numbered C1 and became C158 in 1890. So C2 and C3 were the ones sold to the Wesrtport Harbour Board. There are photographs of C2 working on the Westport Harbour Board’s Cape Foulwind railway. The three miles of formation beyond Fairdown to Waimangaroa had been under construction by John Kirkpatrick since 27 February 1876. The plate-laying contract was awarded to W.H. Topham on 22 February 1876. Mr. Topham used one of the locomotives on his contract. Active operations have commenced on No.2 section on the Mount Rochfort line. The contractor having got on the ground a sufficient quantity of sleepers and rail to make a start, put on sixteen men for plate-laying yesterday. The ballast will be obtained from Sergent’s Hill and a locomotive and trucks are now in use for this work. The extension was officially opened on 5 August 1876. A short branch railway from Waimangaroa to Conns Creek was completed in September 1877. The next piece of railway construction was from Waimangaroa northwards to Ngakawau. The contract for the eight miles of formation and plate-laying was won by John Henderson on March 14 1876. The section was opened on 26 September 1877. At the end of the Conns Creek Branch was the Denniston Incline. A well known photograph taken at the foot of the Denniston incline shows a Dubs locomotive which has quite clearly been converted to a 0-4-2ST. The identity C7 can clearly be read on the locomotive’s headstock in the original photograph. This numbering is understood to have been previous to the identities known to have been held by the locomotives in 1881. The Public Works Statement of 1879 reported the Westport locomotives had been altered from 0-4-0ST. to 0-4-2ST. As mentioned earlier, Dubs 801 was shipped to Waitara in January 1879. Imports : per Kennedy from Westport – 20 tons general cargo and 1 locomotive. So the stock of Dubs C class engines was reduced to two until a third, (makers No. not established) was imported from Napier in 1881. The schooner Sarah and Mary arrived fron Napier on Sunday morning . A locomotive for the Westport railway forms part of her cargo. Dubs 802, 803 and 804 were the sole motive power on the Westport Section until the first F locomotive (Dubs 1370) was landed in early September 1882. Another F (Yorkshire 243, formerly F14 of Southland) was delivered either December 1884 or August 1885 (depending on which source you believe). The Westport Harbour Board’s Cape Foulwind railway was built so rock excavated from various quarries at Cape Foulwind could be transported to the breakwater being constructed on the south (west) side of the Buller river. The railway was isolated prior to the completion of the bridge over the Buller in 1888. The contractors Messrs Price and Clark were charged with completing the railway by 14 December 1885. In this month it was reported that seven miles had been completed. 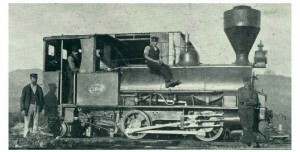 They had a locomotive in their use as early as August, and this was probably one of the NZR Westport Section’s C class. 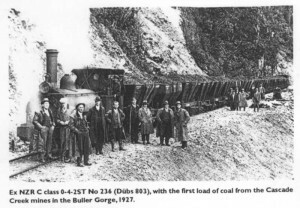 The only way a locomotive could be delivered to the railway construction was to barge it across the Buller River, and all the locomotives that arrived prior to the bridge being completed would have their components floated across the gap. Four Stephenson F’s were delivered in 1886 for the Westport Harbour Board. They had been ordered through the New Zealand Government’s Agent General in London. Reports of the Westport Harbour Board meetings are a good source of locomotive details. We have in hand ordered 7 locomotives, one of which is class C and the others class F. I find the F class to be very unsuitable for the quarries and the wheels are rapidly being destroyed. They are too heavy and stiff in the wheel base to be forced into sharp curves and bad roads at the quarries, for which purpose the C class, having a very short wheel base and a shifting bogie are far more suitable, besides being handier and lighter for shunting. The C engines which we require are one in the limestone, one in the Upper and one in the Lower Granite. The engines which which will be used soon exclusively for tipping should also be C engines, but we will have to use F engines now that we have them. I will enquire whether the Railway Department can let us have two C engines in place of our F ones. Of the seven locomotives ordered, three were Stephensons F’s that had already arrived (plus another landed in the same month). Two Vulcan F’s that were delivered in 1887, and the seventh locomotive – the C – its order was presumably cancelled. The last sentence of the report refers to an exchange of the two WHB F locomotives for two NZR C class locomotives – it happened Stephenson 2598 which is believed to have been one of the locomotives landed from the Grafton in early May 1886 and placed in steam in October, was swapped (along with one of the Vulcan locomotives yet to be delivered) for Dubs 802 and 803. One wonders if this was a fair swap, and I am picking an exchange of money also took place to reflect the different value and age of the two types of locomotives. The Railways Department, although pleased they had acquired two new F locomotives, still required another small locomotive. C53 (Nielson 1773) was shipped from Canterbury in September 1888. It joined Dubs 804 (which became C158 in 1890), and both locomotives were fitted with extended cabs for protecting staff. This also meant the bunkers had to be filled from inside the cab. The last C locomotive to be delivered to Westport was Belmont Nielson 1764. It had been previously used by the contractors Messrs Wilkie Bros and Wilson at Helensville, but was shipped to Westport when that firm was awarded the contract to shift 180,000 tons of stone for the Westport Harbour Board. Belmont was inspected at Westport on 22 July 1889, and given a certificate that expired on 31 March 1890. The locomotive was later sold to the Castlecliffe Railway Co. of Wanganui. On 2 March 1889 the Railways Department took over the working of the Cape Foulwind Railway. The six WHB locomotives were numbered (on paper at least): C274, C275, F276, F277, F278, F279. Which of the six held these numbers is not known. The working was short lived, as all were handed back to the Westport Harbour Board on 27 April of the same year. The system of numbering is important, as the so called 1890 list stopped at R273, these numbers are obviously the continuation. This is evidence that 1890 re-numberings had actually started in 1889, and the system must have been planned as early as 1888. This is further supported by the delivery of C53 as it kept its Canterbury road number rather than being given in the 1882 Westport system. Road numbers held by the Westport Harbour Board locomotives are still a mystery to researchers today, as there was no logic to the systems. The following are numbers known to have been held by WHB locomotives: Dubs 802, C236, Dubs 803, F5, Stephenson 2611, F10, F238, Vulcan 1180, F16, F237, Stephenson 2594, F18, F239, Stephenson 2596. All of the above road numbers were in use by the Railways Department elsewhere on their system. The numberings may have been introduced by one or more of the various regimes that worked the Cape Foulwind Railway over the years. C53 was fitted with the original boiler from C194 (Nielson 1771) in 1892. This lasted until 1900 when both C53 and C158 were fitted with new Addington boilers. C53 was sold on 1 June1920 to the South Otago Freezing Co. of Finegand for £1,000. Last used in 1941, it is said to have been broken up for scrap circa. 1955. C158 was sold to the NZ Pine Co. of Colac on 14 July 1920, also for £1,000, and quickly shipped to Bluff. After about 5 years it was sold to the Otago Harbour Board for hauling rock from its Aromoana quarry. Last used in 1933 it is said to have been scrapped shortly after. Dubs 802 was sold to Bowater and Bryan, sawmillers of Omau in early 1921. In November of that year it was transferred to that company’s operations at Fairdown. The Fairdown sawmill railway closed on 30 June 1924 and in December the locomotive was returned to Westport. It was noted as derelict in Bowater and Bryan’s Palmerston Street yard as late as 1934. By March 1939 Dubs 802 had been fitted with a new Despatch boiler in Greymouth and then transported to Bruce Bay. It was used by the Bruce Bay Timber Co. until the mill closed in October 1945. From July 1950 it was working at the New Forest Sawmilling Co. railway at Ngahere. Last used in 1961, Dubs 802 was eventually scrapped. Dubs 803 (C236) was used by the Westport Harbour Board until at least 1922. In February 1925 it was sold to the Public Works Department for £500. The PWD used it on Buller Gorge construction until its boiler (its original) was condemned year ending 31 December 1928. After useful parts were removed in 1931 permission was given for it to “be disposed of by dumping in a convenient or other manner where it will not be an eyesore to passing traffic”.